This bundle contains The Faith of Ashish, The Hope of Shridula, and The Love of Divena. Virat and Latha named their son Ashish, for he is the light and glory of their world. Yet a simple drink of water from the wrong cup changes them forever. Virat, Latha, and Ashish are Untouchables in 1905 India, members of a caste who must never contaminate the world of the other, higher, castes. When Ashish is in desperate need of a doctor, Virat risks everything to save his son and ventures into the dangerous realm of the high caste. There, the strength of a fathers love, the power of a young British nurse, and the faith of a child change the lives around them. India: 1946. For forty-eight years, Ashish and his family toiled as slaves in the fields of the high-caste Lal family, and all because of one small debt. At fifty-four, Ashish was old and worn out. Every day was a struggle to survive for his family including his only daughter. His wife had named the girl Shridula (Blessings). Perhaps the name will bring you more fortune than it brought me, Ashish told his daughter. His words proved to be prophetic in ways he could never have imagined. And when the flames of revolt brought independence to India, they seared change into the family of Ashish. India 1990. Shridula, old and stooped at fifty-nine, makes her painful way to pay homage to the elephant god Ganesh, lord of success and destroyer of evils and obstacles. Why are we Hindus instead of Christians? her seventeen-year-old granddaughter Divena asked. Because we are Indian, said Shridula. So begins a spiritual journey for Divena as she struggles against an entire culture to proclaim a faith close to her heart while rocking the world of two families. 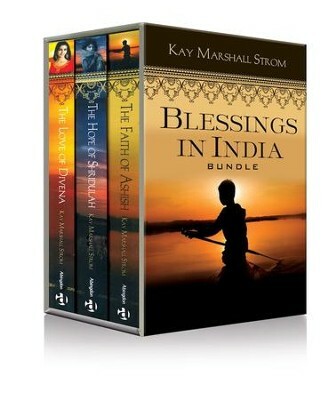 I'm the author/artist and I want to review Blessings in India - eBook.